As you probably know, June 25-29, 2012 is Audiobook Week here at Devourer of Books! If you haven’t heard about Audiobook Week yet, check out my first post on the topic. There will be a lot going on here, and I hope that you will consider taking part! I will have daily reviews as well as daily discussion/exposition topics on audiobooks. At the end of each of my reviews and each discussion topic I will have a Mr. Linky for you to leave a link to your audiobook review/discussion post. If you have anyone guest post on your blog about audiobooks, or write on another audiobook-related topic you can link those posts under the discussion topics as well. I f you would like to participate but do not have your own blog, feel free to leave your own reviews and responses in the comments of the appropriate posts. I’ve had some generous sponsors, so I have LOTS of copies of audiobooks to give away to give away next week. Every day I will choose at least one person who has included a link to a review and one person who has included a link to a discussion post to win an audiobook, and will choose at least one other winner from commenters here next week. A few other participants will also have opportunities to win. I will have a list of all the audios I have available (and where they can be shipped), winners will email me their choice at audiobookweek@gmail.com and I will remove the selected title from the list. Since I’ll be choosing from the Mr. Linky, PLEASE make sure your blog has an easily found way to contact you! Discuss the essentials of audiobook reviewing. What do you make sure to include? What do you want to see when you read other people’s reviews? This will not be up until the morning of Wednesday, June 27th, but it will be short and fast, so check in and join the fun. Thursday: What Makes a Good Narrator? Who are your favorite narrators and why? What do you look for in a narrator? Have a preference between male or female narrators? Alternate suggestion: Narration preferences – single narrator, multiple narrators, full cast, etc. I am really looking forward to this week! I am still fairly new to consistent audio book listening, and yet it’s really expanding my reading. I’m so excited. I can’t wait! This is awesome!! I’m totally going to take part! OK if I link to my interviews with women who work behind the scenes in the audiobook industry? I’ve been posting these 3x a week so far this month but am going for 5x from June 25 – 29. I will also have some giveaways and hope to offer a narrator’s POV on your topics. Yay! I am really looking forward to Audiobook Week! I was excited to read the topics. I think you’re celebration is the answer to my writer’s block post-BEA. I feel like you have turned me into an audiobook reader qualified enough to actually answer the above questions with a strong knowledge of audiobooks!! 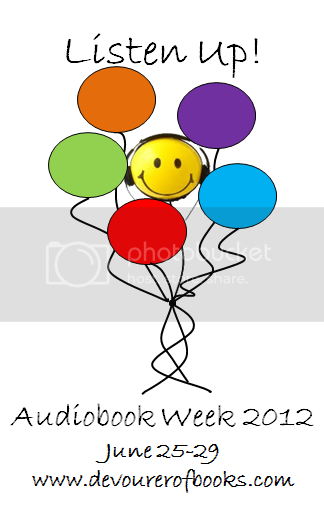 I am looking forward to Audiobook Week 2012!! Okay, so, this comment made me tear up a little bit, and I’m pretty sure not just because of the pregnancy hormones. I am looking forward to this. I’ve already scheduled a couple reviews for that week. Is having a twitter handle linked good enough for a contact point, or would you prefer an email address? I’ve been very lazy about getting that stuff up. I’d say email is probably preferred, but Twitter is really fine, as long as you’re on regularly enough that you will see your @ replies if you win. I am sooooo excited!!!! I am in! I am in!!!! I can’t wait for Audio Week…I participated last year and had a great time. Thanks for hosting this!!! Like Karen, I’d love to list the series of daily interviews I’m doing with various members of the audiobook community. I’ve included a link to the youtube channel where they live. Yep, grab the graphic from the page (the HTML is all ready for you on this post, if you want to do it like that). On any given day you can post either a review, the daily discussion topic, or both. Enter the link to your review on my review post for the day and the link for your discussion post on my discussion post for the day. Sounds like you’ve planned a fantastic week. Look forward to it! Just last week I told a friend I need to get some audiobooks to listen to on my way to work, and I happened to stumble upon your site, so I’ll be heading to the library ASAP. I have included a link to this article in my blog post and plan to link to other posts during the week. I’m looking forward to it. Just for verification, does the review link need to be NEW review or can we link reveiws we’ve done in the past month or so? I’d prefer new, since the point is sort of having everyone talking about audiobooks at the same time, but if you have enough for three or four days and want to participate every day I guess one or two could be old. Never met an audiobook week I did not love. Thanks for once again putting this together for the rest of us.